Located 110km north of alicante airport, Denia is one of the most accessible / cheapest venues to reach from Scotland. It has over 325 days of sunshine per year, is one of the driest parts of europe with warm temperatures through March and April but not excessive heat. It is well known as one of the best cycling destinations in Europe and a regular haunt of pro teams. 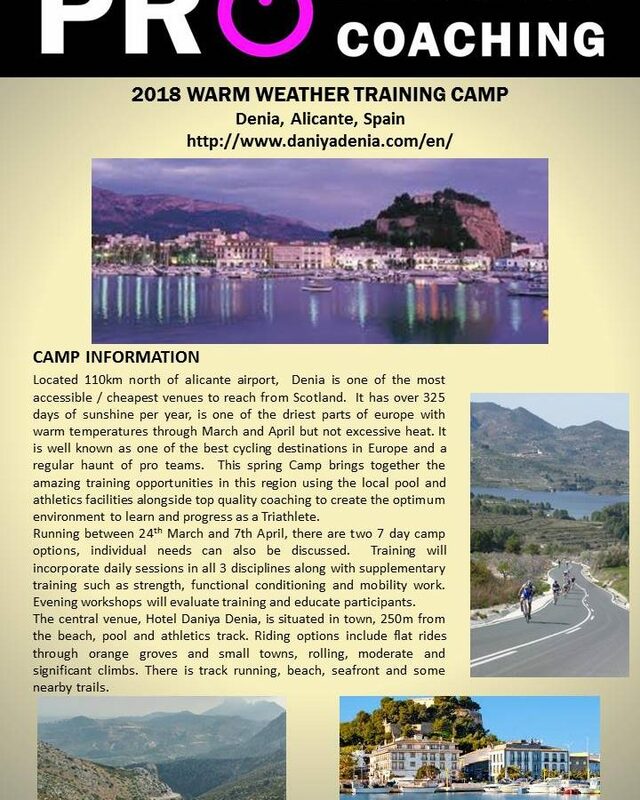 This spring Camp brings together the amazing training opportunities in this region using the local pool and athletics facilities alongside top quality coaching to create the optimum environment to learn and progress as a Triathlete. Running between 24th March and 7th April, there are two 7 day camp options, individual needs can also be discussed. Training will incorporate daily sessions in all 3 disciplines along with supplementary training such as strength, functional conditioning and mobility work. Evening workshops will evaluate training and educate participants. The central venue, Hotel Daniya Denia, is situated in town, 250m from the beach, pool and athletics track. Riding options include flat rides through orange groves and small towns, rolling, moderate and significant climbs. There is track running, beach, seafront and some nearby trails. All athletes need to be familiar with group riding and using clipless pedals. The camp only has so much coaching resource available so it’s important that you choose the right week for your abilities in order to deliver the optimal service for everyone. Flights, accommodation, meals, bike carriage or hire, transfers and insurance are not included. This year the camp has to run differently to previous years. Pro Endurance Coaching unfortunately cannot be a travel agency!! Participants need to book a camp place through the Pro Endurance Website by purchasing the appropriate weeks package which covers coaching fees, facility costs etc. Participants then need to arrange their accommodation , flights and transfers (Pro Endurance will co-ordinate transfers for those on the suggested flights). www.jet2.com Have direct flights from Glasgow currently with half price bike carriage. Week 1 outward 24th March, return 31st March currently ~£160.00 with bag and bike. http://www.daniyadenia.com/en/ Best booked direct through their website though there are additional rooms available through booking.com etc. Space is limited though there is currently enough space for camp capacity. We can advise on athletes looking for twin share. We strongly recommend the half board option (breakfast and evening meal in buffet restaurant for convenience. Week 1 price currently ~£360 per person if sharing on half board. Good bikes are available if you don’t wish to transport your own. The hire business is 150m from the hotel.